mmsonline.com September 2017 MMS 199 EMO 2017 September 18 - 23 general sur faces. The large radius on conical barrel tools allow significantly wider step-over, while the tool's conical sur face enables shor t c u t te r s to b e u s e d. In ad d i ti o n, h o l d e r s a re assured with a collision detection process. The syste m a lso e na ble s the use r to c ontrol the contact point to increase cutter life or to help reach in specific areas. The company will also debut a virtual machin- ing center solution that uses NC code after the postprocessor is run as a basis for the simulation, ensuring that virtual machine movements cor- respond precisely to real machine movement, and display its HyperMill 2018.1 software release. Open Mind Technologies USA Inc., call 888-516-1232 or visit openmind-tech.com. END MILLS DESIGNED FOR TITANIUM, STAINLESS STEEL, NICKEL-BASED ALLOYS Y G-1 TOOL CO., BOOTH E03 Y G-1 will showcase its Titanox- Power end mills for titanium, stain- less steel and nickel-based alloys. They are available in a variety of corner radii and flute options, and the true double-core design is said to provide optimal per formance while roughing, semi-finishing and finishing. The roughing tooth pat- tern is said to enable ma ximum material removal rate while slotting, pocketing and profiling. The smooth variable helix and pitch are designed to quiet tough material while semi- finishing and finishing. Y G-1 Tool Co., call 800-765-8665 or visit yg1usa.com. COMPUTER TOMOGRAPHS PROVIDE FLEXIBILITY WITH SPEED, LARGE MEASURING RANGES ZEISS INDUSTRIAL METROLOGY US HQ - MN, BOOTH B74 Zeiss will highlight its Metrotom 800, which has an ex tended per formance spectrum, and its Metrotom 1500. 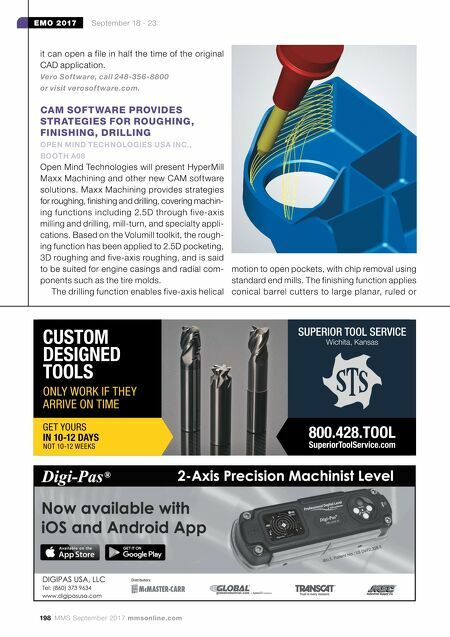 These computer tomographs are designed to address companies' need for It's easy to say your tooling solves problems . It's harder to prove it. We prove it every day. 16 E. Piper Lane Prospect Heights, IL 847-749-0633 info@heimatecinc.com www.heimatecinc.com Stuck on a tough tooling challenge? Let us help. 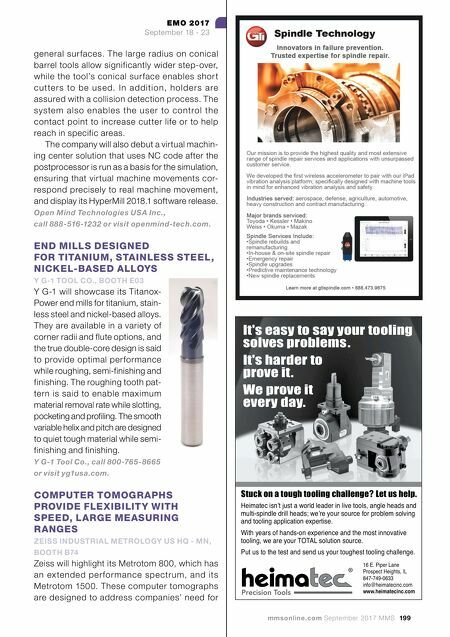 Heimatec isn't just a world leader in live tools, angle heads and multi-spindle drill heads; we're your source for problem solving and tooling application expertise. With years of hands-on experience and the most innovative tooling, we are your TOTAL solution source. Put us to the test and send us your toughest tooling challenge.